Wheat has been found in a settlement on England’s south coast dating back to 6000BC – 2000 years before farming reached Britain. This finding overturns many cherished archaeological beliefs – or myths – about the era. Though they were once patronised as simplistic hunter-gatherers, it turns out early Britons must have been active traders with the agricultural superpowers of their day in France and the Balkans. It’s time to reassess Mesolithic man. The introduction of farming is usually regarded as a defining historic moment for human societies. Agriculture creates the conditions for permanent settlement, urbanisation and complex societies. The positive impact and significance of farming, starting during the period known as the Neolithic, is often contrasted harshly with preceding hunter gatherer cultures. These societies, associated with a period entitled the Mesolithic in Britain (c. 10,000-4000 BC), were relatively mobile and the passage of time has been unforgiving in respect of the survival of their material culture. This has meant a tendency to presume the peoples of pre-farming Britain were socially simple and geographically isolated. The recent TV show 10,000 BC, which approximates this period, perpetuates the view that life at this time was simply “nasty, brutish and short” with little for people to do other than eat hazelnuts as they waited patiently for wiser peoples from the East to arrive along with the lifestyle benefits of the new technology – farming. Mesolithic northern Europe had lots of extra land (light green). Yet Mesolithic societies were as complex as any other. For instance, the earliest built ritual monuments in Britain, usually associated with farming societies, emerged as early as 9000BC near Stonehenge and one structure in Scotland may represent a calendrical device nearly 5000 years older than the first historical calendars. The first permanent homes and domestication of animals including the dog also occurred before the introduction of farming. Yet, the use of grain and specifically wheat, remained essentially absent and a key indicator of farming in regions far from south west Asia, where grain was domesticated 12000 years ago. Consequently, a debate continues as to whether farming was introduced following colonisation by groups already practising agriculture or the new technology was adopted by indigenous hunter gatherer populations. Was farming a movement of people or ideas? 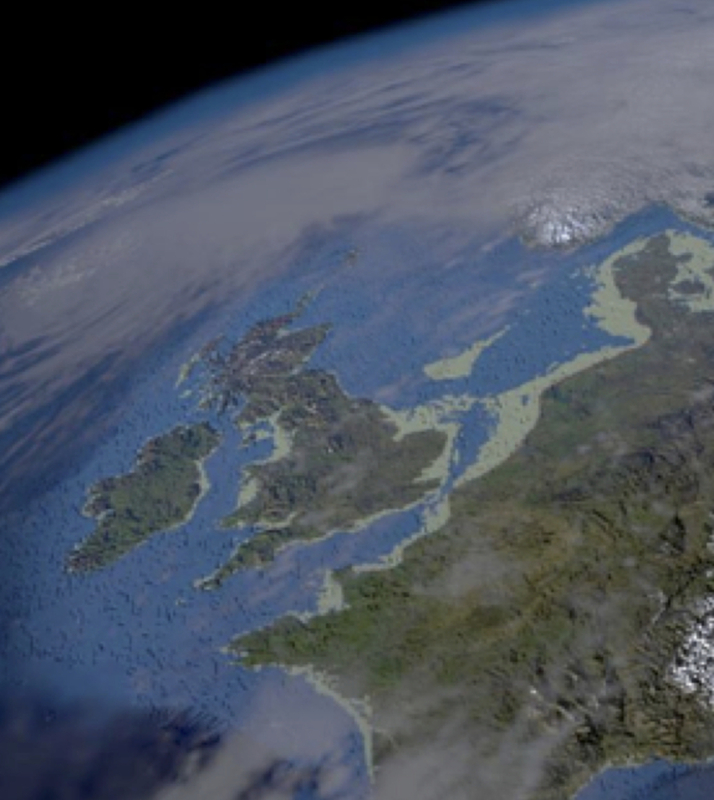 Farming is thought to have been introduced to Britain in around 4000BC, perhaps held back by the island’s new isolation following sea level rises at the end of the ice age. The same processes, however, also provide an opportunity to preserve evidence and Britain’s continental shelf has exceptional archaeological potential. 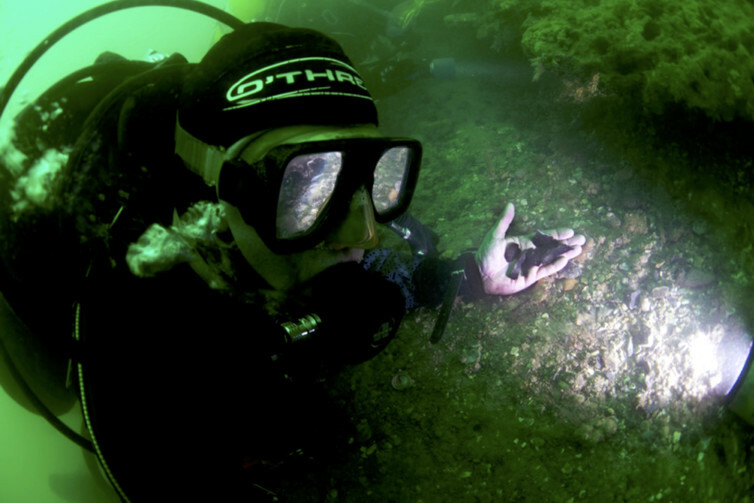 To investigate whether early traces of farming might be preserved in sediments on the sea bed, we gathered a team from the Universities of Birmingham, Bradford and Warwick, together with the Maritime Archaeology Trust. Our results, just published in the journal Science, suggest that grain, rather than indicating the onset of farming, was actually present in Mesolithic settlements in Britain 2000 years before local agriculture. We found evidence of grain after analysing DNA recovered from the uniquely preserved Bouldnor Cliff off the south coast of Britain. In the past ancient DNA has most commonly been obtained from anatomically intact material, such as hair, bones and teeth. It has only recently become clear that DNA can also be retrieved from other materials, including sediments, or SedaDNA – a discovery which has the potential to revolutionise the field. The sedaDNA sequences at Bouldnor Cliff suggested a mixed habitat of oak forest and herbaceous plants, much as we would expect. We found traces of animals that could indicate human activity – lots of dogs, for instance, and aurochs (ancestors of the modern cow), as well as deer, grouse and rodents. Garry Momber of Maritime Archaeology Trust with 8,000 year old Bouldnor Cliff flints. However, in later sediments, dated to 6000 BC, the results revealed the presence of Einkorn wheat. This was 2000 years earlier than expected and at a time when the cutting edge of agriculture may have lain in the northern Balkans or possibly on the Mediterranean coast of France. What does this mean? In the absence of direct evidence for cultivation, it seems likely that wheat was imported rather than grown locally. If so the implications are considerable. The presence of wheat suggests the existence of a web of social networks stretching between Mesolithic Britain and the advancing Neolithic front far to the south and east. Far from being simple or isolated, the Mesolithic peoples of southern Britain were probably engaged in trading or gifting exotic foodstuffs across much of continental Europe – it seems absolutely unreasonable to imply that hunter gatherer groups were passive recipients in such an exchange. The results also indicate that key historical events, including the arrival of people in the Americas and agricultural development of Southeast Asia, may also be best explored through investigating the extensive land masses that were lost to the seas as a consequence of global warming. The results of the work at Bouldnor Cliff now suggests that that such landscapes also retain caches of genetic material that may not be preserved or even represented on land. If so the analysis of marine sediments may be an archaeological “game-changer”.